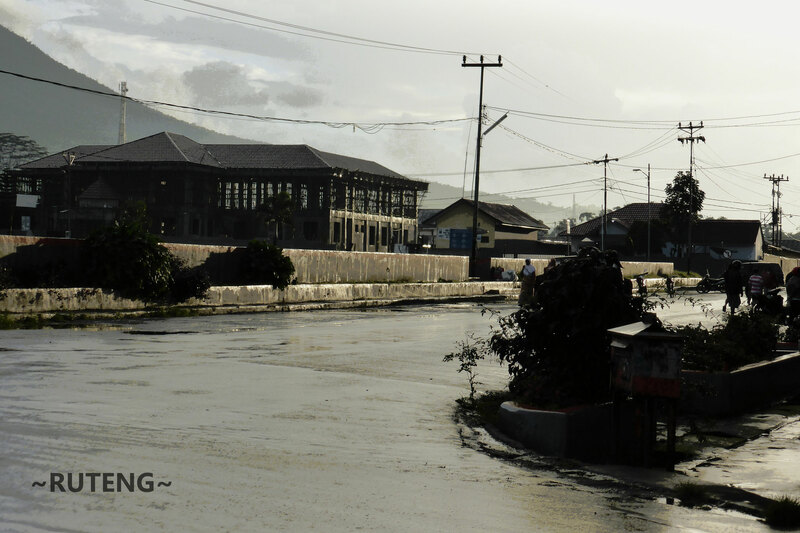 The capital of Manggarai (ibu kota) is Ruteng surrounded by mountains. 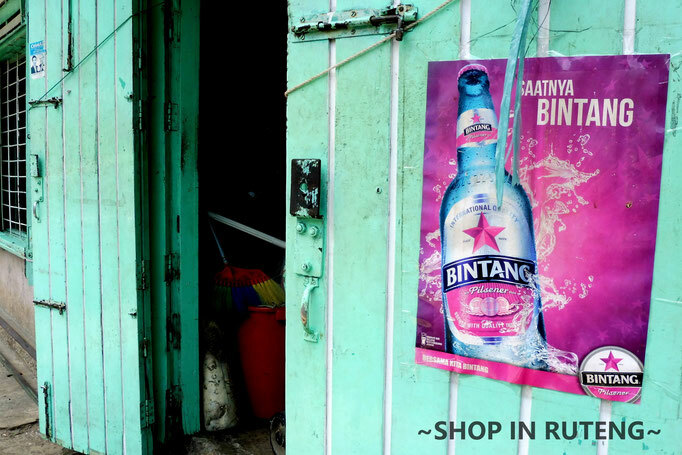 Ruteng is a lively town (well, at least untill 8 pm) with a wide variation of eateries. It is often rainy, hazy (in the late afternoon) and cold at night (by Indonesian standards) but this is why Manggarai is so beautiful. See also stories. The market is huge and lively as well and worthwhile a visit, as is the cathedral which marks the citycentre. People from the western half of Flores come here for their education as there are for some reason many schools. Manggarai people are the Chinese of Indonesia (together with the Batak people from Sumatera). 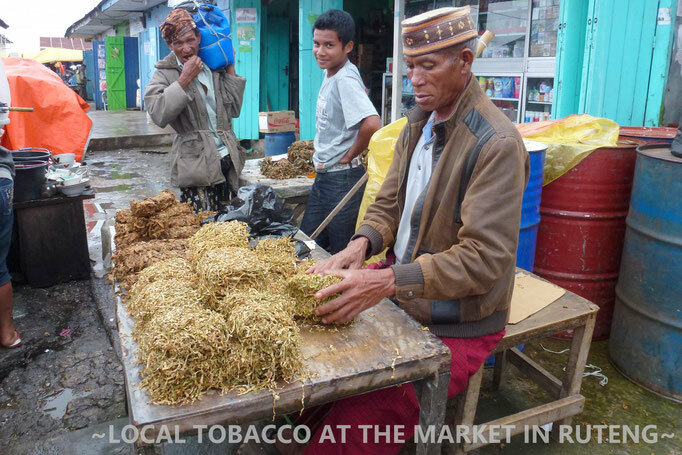 Ruteng has many eateries like the padang and Jawa restaurants and warung bakso. Cha Cha is a cosy tourist restaurant (well, at least many of the customers are tourists). Food is excellent and you can have a beer with your meal. Also recommended is Alline Pizza. Large supermarkets are Sentosa, Pagi and Swalayan 38 but they close early. Another new one is Supermarket Nirwana on jalan Banteng. There are two laundries near the postoffice. Both have a one day service including ironing. Ruteng has a connection with Kupang (Timor). The airport is northeast close to the town. Like everywhere else cars and ojek (motorcycle) are available at the airport. 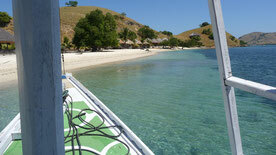 There are buses to Bajawa, Borong, Labuan Bajo, Maumere and Reo. As almost nobody starts their journey in Ruteng you best can hire a car in Labuan Bajo or coming from the east in Bajawa, Ende or Maumere. If you need one in Ruteng, hotels can help you to find a driver, or contact me. Rp 3000 to Rp 10.000 for a ride which should be the standard rate. This is a kind of shared “taxi” (a big car or minibus which runs from door to door). They run the same routes as buses. Costs Rp 100.000 - Rp 150.000. The nearest seaports usefull for tourists are in Labuan Bajo (for Sape on Sumbawa, Makassar on Sulawesi) and Aimere (for Waingapu on Sumba). Check the section transport in Manggarai or Ngada. 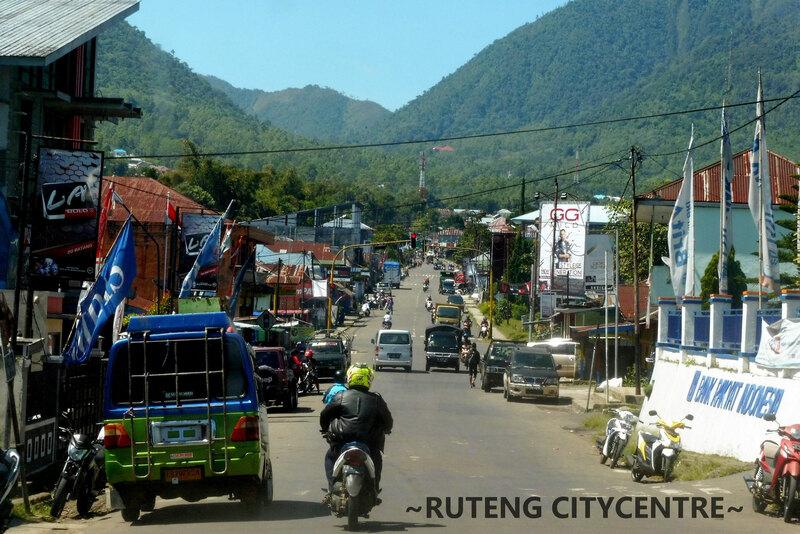 Follow the road uphill just outside northern Ruteng and after a few kilometers you will enjoy a panorama of Ruteng town. On top of the hill there is a plateau with a statue of Maria. In 2003 an Indonesian archaeologist discovered the remains of the homo floriensis in Liang Bua, 15 kilometers from Ruteng (Manggarai). Check out facts and thoughts about homo floriensis. 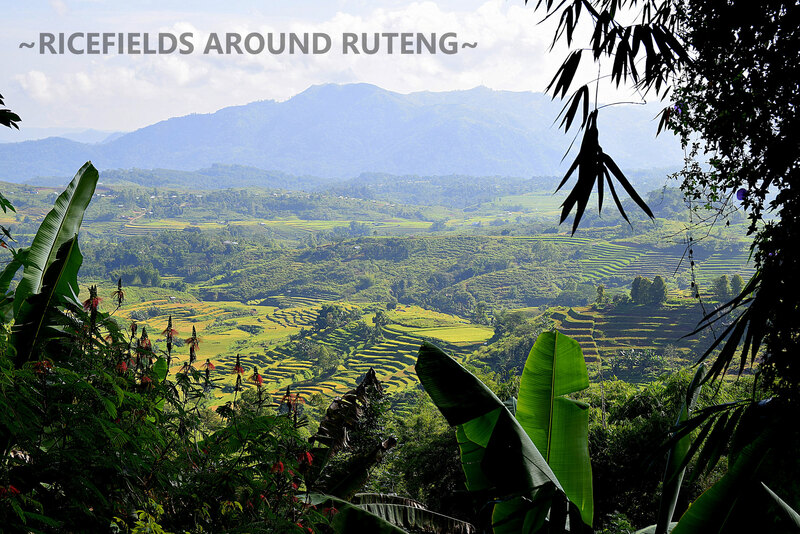 Liang Bua is only 12 kilometers from Ruteng but via a small road. Ik takes 45 minutes to get there (checked May 2018). The road to Reo itself is an attraction and although it is 1,5 hours Ruteng it will takes much longer as you want to stop frequenlty. Reo is a lazy small town at the banks of the Reo river which is an attraction itself. Crossing the bridge in the direction of Dampek you are in Manggarai Timur again. West of Reo you follow a small but good road. Nice beaches near Robek, pantai Ketebe. At the moment you cannot reach Lemarang as the bridge has been collapsed; not possible to pass with car. There are more deserted beaches. At the time of writing (October 2018) you only can drive as far as a few kilometers before Lemarang as the bridge is collapsed an no signs yet of building a new one. There is a bamboo bridge which can be used for motorcycles but is doesn't look that strong. Local people cross the bamboo bridge with their motorcycle but buddypassengers cross wading the river where the water was kneehigh. After heavy rain it is even not possible to cross. Local people from Lemarang have to use boats by that time. Just take one of the roads east before or west after Ruteng and you come across amazing views, green rice terraces, misty mountainviews and deserted villages. 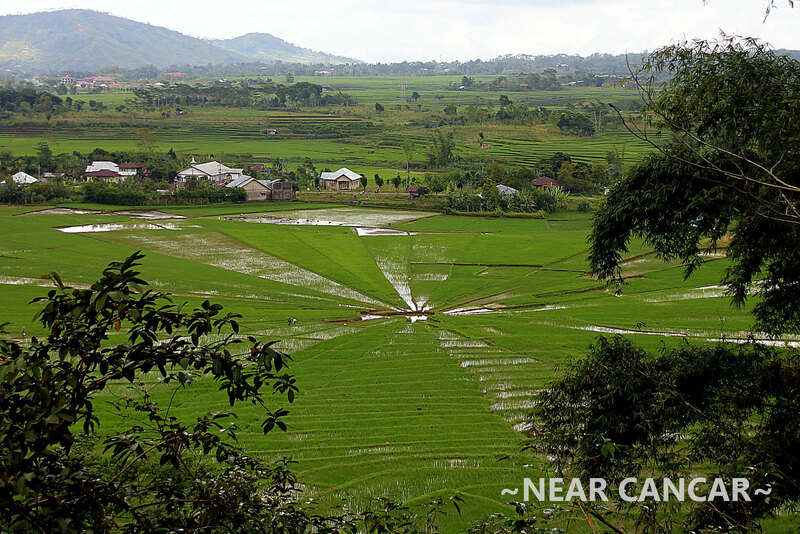 Cancar is famed for its spiderweb ricefields. Take the turnoff to the right at the junction in Cancar (Trans Flores Road to Labuan Bajo) and after a few hundred meters there is a hill on your left. Pay Rp 15.000, walk up the hill for 5 to 10 sweaty minutes and overview the spiderricefields. The ricefields are in "spidermodel" with the heart of the "spider" at its lowest point, a smart construction for the irrigation of the ricefields. 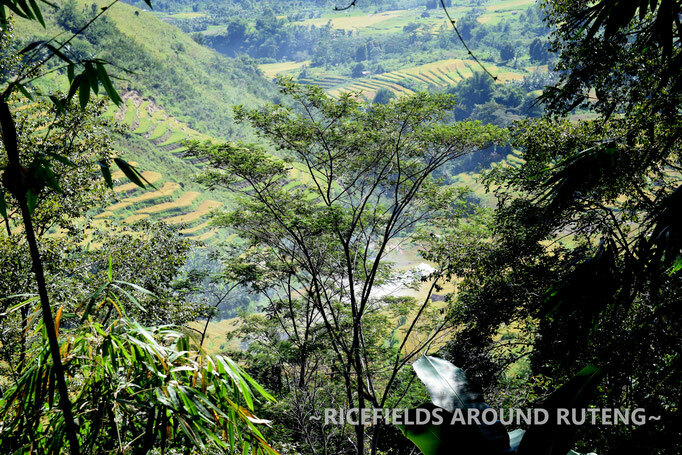 There is also a spider ricefield to be viewed 500 meters from the turn off a few kilometers beyond Cancar (right from Ruteng) via a bumpy road (but you don't need to climb). 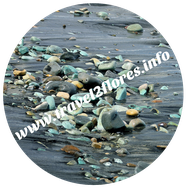 You also can drive around the valley and meet the Trans Flores again 5 kilometers eastwards but the road is bad and bumpy and may be that bad that you have to go back to Cancar again. Looking on the map Tangkulese waterfall seems not so far from Cancar which is true when it comes to distance. But, to get there is not so easy. The "best" route (still potholed on many stretches) is via a road inland. Turn right near Golokoe, then follow the direction of Kokar. It will take 1,5 to 2 hours from Ruteng. From the village you'll have to do some trekking to reach the waterfall (1 hour) but you can see the waterfall from a distance. Go early morning as after 2 pm it will rain (almost every day). There is a road from Cancar as well but not recommended for cars (motorcycle only). This road, potholed and bumpy crawls between two huge mountains into the forest and is part of a national park and offers fine views. This can also be an alternative to get to Dintor to continue to Wae Rebo. See below. Follow the Trans Flores Road further west an take the turn off to Todo and Wae Rebo. The road is small and bad, the views terrific. In Todo a guide/citizen awaits you in sarung and he will take you to the traditional houses and starts the explanation in singsong English (although I tried to communicate in Indonesian). Not really a boost for this tourist attraction. The orginal residents have already moved years ago from the traditional houses. 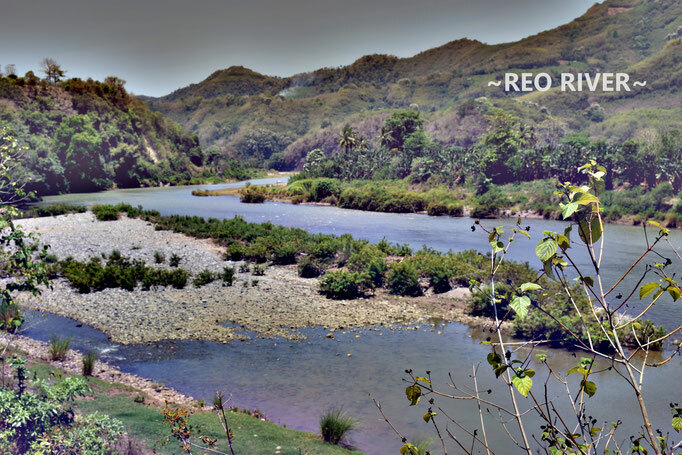 Wae Rebo is one of the main attractions of Flores and has become more and more populair in the last few years, not to say a big hype. It is a traditional village secluded in the mountains. Wae Rebo is one of the highlights I did not yet visited myself. I recently made it to Denge, the startingpoint, mostly to check the road and drivingtime to get there. Trips are made from Ruteng via Todo, Dintor and Denge. There is an alfernative road via Iteng. The road via Iteng is shorter in time when coming from Ruteng, about 4 hours to get to Denge, but the road to Iteng is very bumpy (far more bumpy than via Todo). 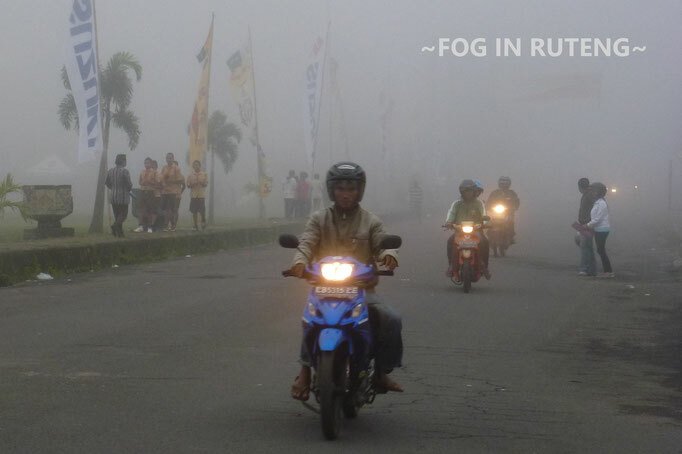 Via Todo it takes 3,5 hours from Ruteng to Dintor. Coming from Labuan Bajo there are two options. Via Todo by car it is around 6,5 hours to Denge. The same route by motorcycle can be done in 5,5 to 6 hours. There is also a road via Nangalili on the south coast, which only can be done by motorcycle. This wil take 4 to 5 hours. From Denge you have to walk uphill and this will take 3 to 5 hours depending on physical condition and weather. Experiences are different. Some people have to give up halfway (or earlier) as the trekking is too heavy. Some people find the place too touristy. From Denge you need a porter/guide. The fee is Rp 200.000 (per person, or group). Porters/guides are available at any time. They can carry luggage up to 10 kgs. Note: sometimes tourists do not want a porter/guide with the reason they are traveling on a budget. I strongly advise not to go alone, eg without a porter/guide. Although the track is spacious enough there are no signs and as the trail is through forest and on high elevation weather conditions can change quickly. But touristy and physically heavy or not, Wae Rebo is still an unique place to go to. Apart from Ruteng, trips come more populair starting in Labuan Bajo (and I think Wae Rebo has become populair precisely because of the increase of tourists in Labuan Bajo) although it takes more time coming from Labuan Bajo. Tourists can overnight at the village in one of the traditional houses and sleeping on the floor with a maximum of 30 people for a steep Rp 325.000 per person, plus Rp 20.000 for the ceremony. So if you travel/go alone the expenses are Rp 545.000 in total. If you can share the porters fee with other people it will be a bit cheaper. There two options to overnight the night before. 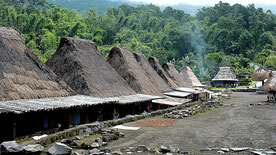 You can stay at Wae Rebo Lodge in Dentor for Rp 250.000 per person. They also will arange the porter for you. Tel +6285239344046 or +62 81237121903 (both mobile). In Denge (20 to 30 minutes from Dentor) you can overnight at the homestay of mr. Blasius Monta tel. +6281339350775 for Rp 200.000 night/person. The other thing to consider is that the villagers are infected by the hordes of tourists in the months of June, July and Augustus and tourism will take over traditional life in Wae Rebo. You also can choose for a hike in one day. This is best done when coming from Ruteng. Start from Ruteng early morning around 6 am, followed by the hike and then downhill for 2 hours so you can stay in one of the two guesthouses. A (very long) daytrip from Ruteng is possible as well. If you want to visit a traditional village on Flores there are some good alternatives which are less touristy and businesslike. 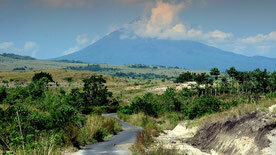 Try Belaraghi on the way from Bajawa to Ruteng for example or maybe Bena south of Bajawa near Inerie mountain. See above. By car it is best done by suv but actually even better by motorbike as 75% of the road is in bad condition. Rp 1.500.000. The difference of Rp 200.000 is actually for accommodation and food for the driver. 5 to 6 hours I think. The road out from Dintor traveling from west to east or in from Ruteng to Dintor can also be done via Iteng on the south coast. However at the time of writing (October 2018) you will not save much time as the bridge near Iteng is broken and a detour has to be made and the road Iteng to Ruteng is very, very bad. See the stretch above. The only advantage is you can use different roads and the Ruteng-Iteng Road runs through dense forest. After all this is part of the adventure too.